Scottish Highlands: A trip unlike any other — through a land unlike any other. If only we could paint, instead of write, a trip description. The name itself conjures images of rich green hills, towering peaks, stone castles, mysterious lochs, wild heather, and villages seemingly untouched by time. Travelling one of Scotland’s best-known hiking routes, you’ll fall in love with both the Scottish terrain and the warm welcome of its people. What’s more, you’ll form strong friendships with your group mates and revel in your shared accomplishments in this deeply historic country. Arriving in Edinburgh, we’ll dive headfirst into the Scottish landscapes as we head to the southern shore of Loch Lomond and the West Highland Way. We’ll break out our boots and set out on the Way along the “bonnie banks” of Loch Lomond. The transition into the Highlands proper is subtle and spectacular as we work our way north towards the villages of Inversnaid and Bridge of Orchy. Along the way, we’ll learn to hike, cook, play, and live cooperatively as a unit. We’ll pause for a rest day in the village of Tyndrum before making our way over Rannoch Moor, the “remotest and wildest section of the whole Way.” Awed by the wild beauty and enormous scale of the mountains around us, we’ll pass the Kings House Hotel, an inn that has been serving kings and travelers since the 1600’s. We’ll ascend up and over the “Devil’s Staircase” to make our way through the charming village of Kinlochleven and into Fort William, the “Outdoor Capital of the United Kingdom” and the very end of the West Highland Way. We did it! 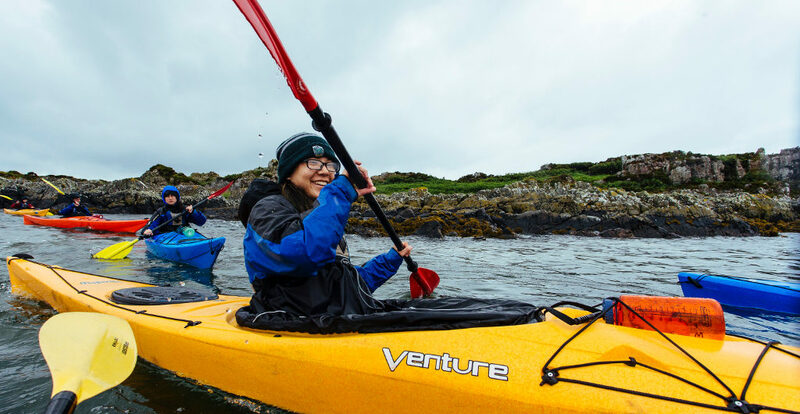 Camping in beautiful Glen Nevis, we’ll rest tired legs and celebrate our completion of the West Highland Way with a magical day of sea kayaking alongside resident seals and nearby castles. We’ll also combine our paddling with a beautification and clean-up project along the misty shores. 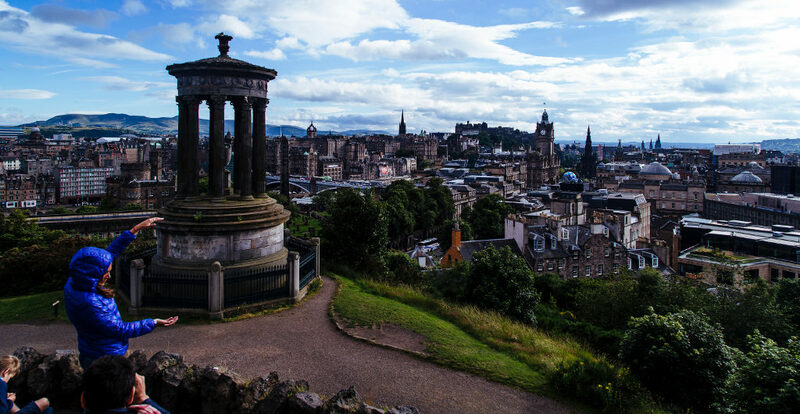 From here, we’ll return to Edinburgh by train, where we’ll walk the famous Royal Mile together and explore the wonders of this beautiful, storied city. Finally, we’ll reminisce about our 13-day Scottish adventure – and discover if anyone is courageous enough to try haggis – during a celebratory dinner on the town. How physically challenging is SH? Given a rating of Challenge Level 6 (out of a maximum of 10), we consider SH to be an intermediate hiking trip that any moderately fit, motivated student can successfully complete with appropriate preparation. Compared to similar hiking trips, we believe SH is a step above California Mountains and Coast and Alaska Mountains & Coast (due to longer mileage and heavier packs) and slightly less challenging than our Pyrenees Mountains & Coast and Alps Explorer. SH is comparable in challenge level to our Northwest Explorer (NWX) trip, because, though SH is one week shorter, the group will be backpacking with heavy packs for the majority of the itinerary. The group will hike approximately 14 miles on their most challenging day, while their daily mileage typically spans 7-10 miles. Please note that all of Apogee’s Challenge Levels are not scientific and are subjectively calculated by the Apogee staff. The group will be camping for six of the 12 nights over the course of the trip, and each of those nights will be spent in established, front country campsites. They’ll spend the other six nights of the trip indoors (in micro-lodges or hostels). Leaders will separate students by gender into tent groups, and will rotate those groups several times over the course of the trip. Students will share a tent with one or two other students. What is the difference between front country and backcountry hiking? What will the backcountry portion of SH be like? How much weight will my child carry during this portion? Generally speaking, the front country is any area that is easily accessible by vehicles and day users. Hiking in the backcountry, on the other hand, involves hiking and camping in more remote locations without running water. Hiking and camping in the backcountry requires more preparation, because of the need to pack all food and gear. 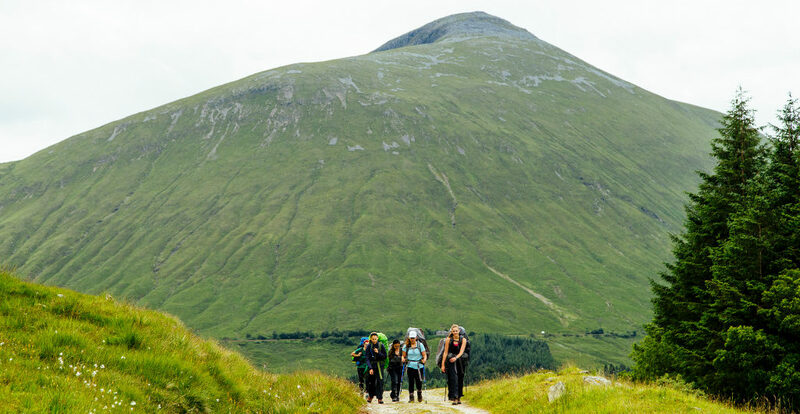 Our SH groups will be carrying several days worth of food and all of their equipment on a point-to-point-style hike along the West Highland Way, so in that respect they are backcountry hiking. However, very few portions of the West Highland Way are truly remote; our groups will be passing through towns and settlements daily. That said, there are portions that will be rugged and not readily accessible to auto traffic. Your child will be carrying their personal gear (sleeping bag and pad, clothing essentials, personal toiletries) along with their allotted portion of group gear and food. For the most extended portion of hiking on our SH trip, your child should expect to be carrying between 25 and 40 pounds in their pack. We’ve discovered over the years that consistent, short-term volunteering partnerships are rarer in the United Kingdom than they are in the United States. While we cannot guarantee community service hours for students on SH, the majority of trips in the past have worked for 2-4 hours on a half-day beach clean or beautification project while kayaking. You can expect to receive a phone call from your child twice during their trip, approximately once per week. Students on international trips will also call home at some point on arrival day, depending on schedules and arrival times. In addition to needing a valid passport, we encourage you to coordinate travel with other attendees. To that end, we’re happy to put you in touch with other enrolled families from your region. Please note that Apogee staff members do not travel with students; our trip leaders will already be in Scotland on arrival day and will stay in Scotland after the trip ends. Apogee staff and trip leaders will have a detailed flight itinerary for each student and will be at the airport to greet them on arrival; our staff will also accompany students to the airport to assist with departures. We will provide enrolled families with a Travel Information document covering details specific to traveling to and from Scotland, including airport information and arrival and departure time windows. We know that international travel can be daunting – rest assured that regardless of flight cancellations or delays, we will always have someone on hand to assist with our students’ arrivals and departures. Apogee’s tuition costs are meant to be all-inclusive and include all meal, accommodation, and activity fees. The most significant additional expenses on our Scottish Highlands trip will include travel to and from Edinburgh, Scotland, a sleeping bag and sleeping pad, a backpacking pack, and hiking boots. What should my child expect in terms of weather and environmental factors on this trip? The Highlands can be a damp place in the summertime. We encourage you to follow the packing list closely, as it will prepare you adequately for the elements. Groups can expect to encounter rainy days on this trip as well as ares of concentrated “midge flies.” We have found that these factors do not significantly impact the trip if students are properly prepared.